Starting a straightening treatment for your teeth is exciting! It’s like turning the page to a new chapter in your life—one with more confidence, better oral health, and a smile you can’t seem to stop showing off. Not only do you get to straighten your teeth, but your dentist in Mesquite, Dr. Byron McKnight, has a discreet way for you to do it! Invisalign has totally changed your outlook on orthodontics. Your anticipation for a healthier, straighter smile brings along many questions, and that’s totally understandable. Our office is more than happy to address any lingering thoughts you may have about your Invisalign treatment, including answering these frequently asked questions. Exactly how does the treatment process work? 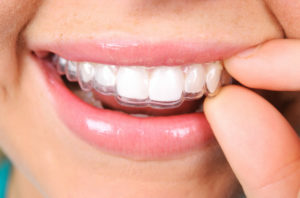 Invisalign clear aligners use several practically invisible, removable, plastic aligners that no one can tell you’re wearing. The aligners are custom-fit just for you. They constantly apply gentle pressure to guide teeth into the correct locations. Keeping your straightening treatment on track is as simple as wearing one set of aligners for about two weeks, removing them only to eat, drink, brush, and floss. As you get further into your treatment, you will replace each aligner with the next in the series until your teeth have shifted to the correct positions. Will using Invisalign be painful? If you’ve done any research on orthodontic treatments, you know that traditional metal brackets and wires can be extremely uncomfortable. Most people complain about their teeth and gums being sore, they’re jaws being tense when elastics are added to their treatment, and lacerations that can occur because of the metal in your mouth. With Invisalign in Mesquite, your treatment is gradual and comfortable. Most patients experience slight pressure after just moving up to a new set of aligners, but that’s a sign that Invisalign is working! Your teeth are slowly shifting without unpleasant tightening appointments from your orthodontist. The length of your Invisalign treatment depends on the severity of your case. This can only be determined by meeting with Dr. McKnight for an open-minded consultation. However, the average case takes about 8 to 12 months. In comparison to traditional braces, that’s lightning-quick! You will only have to meet with Dr. McKnight every 4 to 6 weeks just to check up and make sure your treatment is on course. The best way to clean your aligners is to use the Invisalign Cleaning system. This system keeps your aligners odor-free and constantly clear. Special cleaning crystals remove plaque from your aligners in just 15 minutes or less! Another alternative is brushing them regularly and rinsing them with lukewarm water. What happens after my Invisalign treatment? After you complete any orthodontic treatment, whether it be traditional or something more modern like Invisalign, your dentist will still recommend you use a retainer afterward. This will prevent your teeth from gradually shifting back towards their initial positions. Be Confident, Your New Smile Is Right Around the Corner! More than 4 million patients worldwide have been treated with Invisalign and the number continues to grow every day! Align Technology, Inc. Originally founded the idea of clear plastic aligners in 1997 and since then Invisalign has improved each patient’s straightening treatment. With just about 20 years of practice, you can be confident that Invisalign will straighten your teeth effectively while still staying discreet. Contact the practice of Byron McKnight, DDS to begin discussing your modern straightening treatment today.